WD has redefined the PC with the next big thing in ultra-fast performance storage. Introducing WD Black², the world's first 2.5-inch dual drive storage solution. The WD Black² dual drive is a completely new approach in a compromised solid-state and hybrid storage market. Finally you can have the speed of an SSD that you want and the capacity of a hard drive that you need in your notebook or all-in-one PC. Your requests to make the notebook and all-in-one PC experience better, faster and more dynamic have been heard. We took the challenge and made it our mission to design a storage solution that delivers the ultimate experience. The WD Black² dual drive solves your storage limitations and adds true high-performance SSD speed to your PC. The WD Black² dual drive is the drive you were waiting for, inspired by and created specifically for enthusiasts like you. WD Black² is built by fusing two world-class storage devices together into one dual drive to create the ultimate experience for notebooks and all-in-one PCs. Boot up faster to your operating system with the speed of SSD at your fingertips. WD Black² features innovative 20nm NAND flash with remarkable power efficiency that is poised to redefine what is possible in the storage industry. WD Black² Shift_Technology allows you to migrate larger data files to the hard drive and provides your SSD with less system drag, which increases the overall endurance and mileage of the SSD. With less caching involved, there's less time waiting and more time enjoying the things you love to do most. SSD performance can degrade when total capacities are reached or after a finite number of writes have been reached, which is a major concern for SSD users. We built our dual drive solution to curb these problems. With our WD Black², you can move your larger data or write-intensive applications onto the 1 TB hard drive, ultimately extending the life of the SSD and maintaining optimal performance across the dual drive. Now you can load your OS, photo and video editing programs on the SSD and save all of your capacity-heavy RAW photo and video files to the 1 TB HDD. Keep it all local and readily available on your notebook or all-in-one PC without slowing system performance. Turn your dual-purpose notebook or all-in-one PC into the high-performance gaming machine of your dreams. The dual drive's fully accessible SSD allows you to place your OS and favorite game software directly on the SSD which results in faster boot times and smoother game play while still having separate storage capacity available for your work and personal files. 1 TB hard drive, or split data between both. Take full control and manage the location of your personal data. We recommend viewing the installation videos to understand the best option for your upgrade, whether it be clean installation, cloning or data migration. Relentlessly dedicated to your data, the WD Black² dual drive carries the same industry-leading 5-year limited warranty as WD's other performance storage drives. WD Black² combines the shock and vibration resistance of SSD with the proven technology of the HDD for one truly agile and highly reliable dual drive storage solution. Advanced firmware and intelligent algorithms assist in heightened performance, resulting in cooler temperatures with nearly inaudible operation. WD Black² Dual Drive ships as a full kit with a web key, quick install guide, USB to SATA transfer cable, and warranty information. Software download and internet connection are required for installation. Please watch our how to install videos at http://products.wd.com/wdblack2and choose whether you would like to perform a fresh installation or a cloning installation for your dual drive. 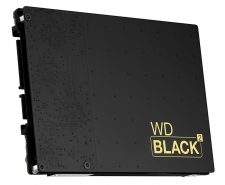 Our revolutionary WD Black² dual drive is designed for use in most 9.5 mm 2.5-inch drive bays. Upgrades of notebooks and all-in-one computers by advanced users and system integrators. Users of video and photo editing, graphic design, games and other power computing applications will benefit the most. *WD dual drives are designed and tested for use in specific applications and environments. This ensures that your dual drive is compatible with and functions properly in your application. Our dual drives are warranted against defects in materials and workmanship in the system for which they were designed. Use in systems other than for what the dual drive was designed could result in compatibility problems that affect proper function, unrelated to material and/or workmanship defects. For best results, be sure to select the appropriate product for your application by consulting our product spec sheets on our website at www.wd.com or by calling our customer support line where we would be happy to help you through the selection process.